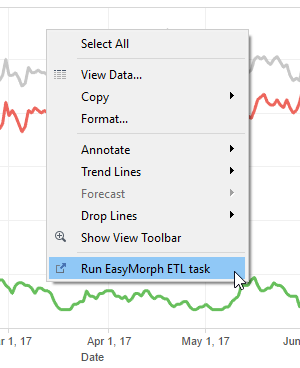 Since EasyMorph Server is built using web technologies, it makes triggering data transformation (ETL) tasks from analytical systems like Tableau especially simple. Triggering tasks right from dashboards is convenient, because you can refresh underlying data sources from a familiar UI in just one click, plus you get additional bonus feature (explained later in this article). 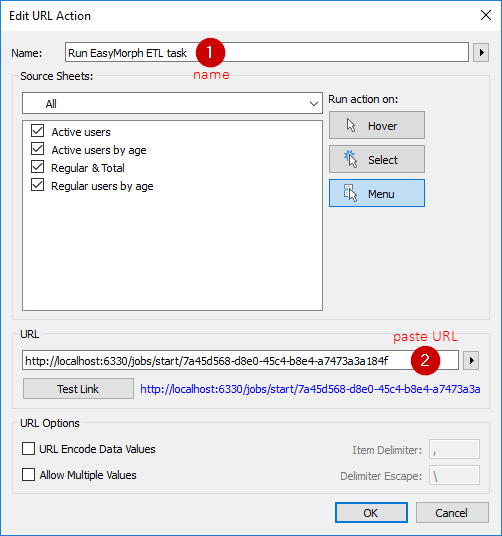 While it might sound cryptic it's actually a simple thing -- we just tell EasyMorph Server that particular task may be triggered by opening specific URL (hyperlink). This option is disabled by default in order to avoid accidental task triggering, because a task can potentially perform an irreversible action, e.g. overwrite data in a database table or file. 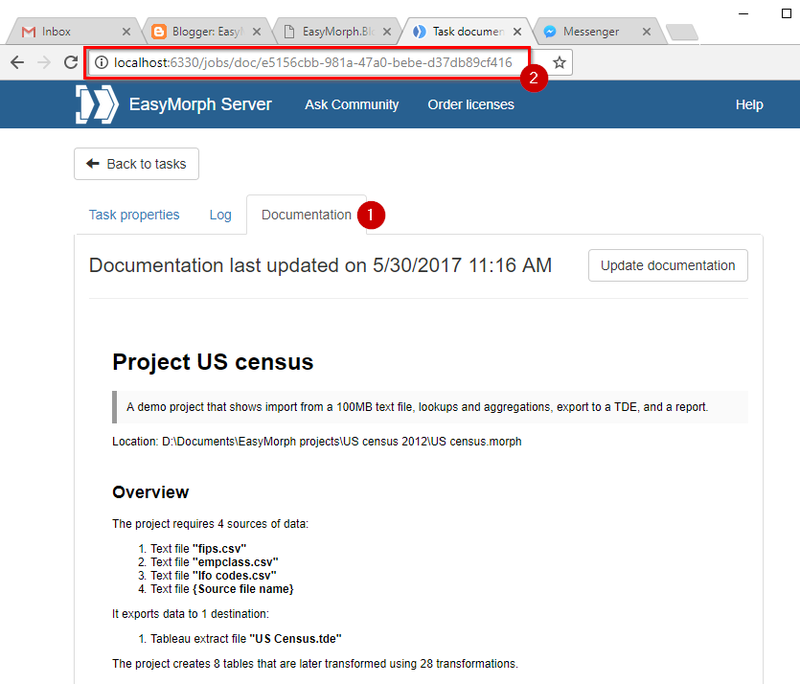 To enable triggering by opening a hyperlink, go to the task properties in EasyMorph Server web-console and tick "Enable HTTP GET". 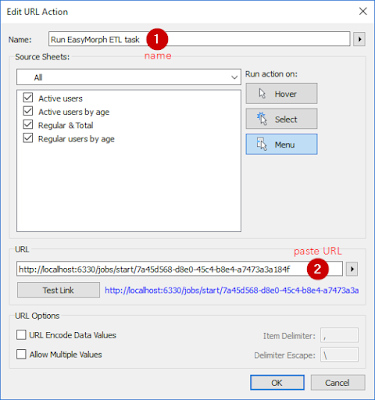 Enable triggering EasyMorph Server task by URL (click to zoom). Then copy the generated URL. In the example above the server address is localhost, in your case it would be your EasyMorph Server address. Don't forget to save the change in task properties -- it won't work until you save it. Now go to Tableau and create a new URL action (menu Dashboard -> Actions -> Add Action -> URL). Give the action a name and paste the URL copied in Step 1. Create URL Action in Tableau (click to zoom). Now right-click anywhere in your dashboard and trigger the EasyMorph Server task from the right-click menu (actions appear at the bottom). This will open default web-browser showing task execution log updated in real time. Once the task is finished you can go back and refresh the dashboard (in some scenarios it updates automatically). Mission accomplished. Trigger EasyMorph task from Tableau. EasyMorph Server can generate a human-readable description of a task's data transformation logic. This is convenient because it explains in plain English how the source data was processed into the dataset displayed in the dashboard. You can see all the transformations, expressions and filtering conditions, as well as helpful annotations. Since generated task documentation has a permanent URL it also can be added as an URL action in Tableau. 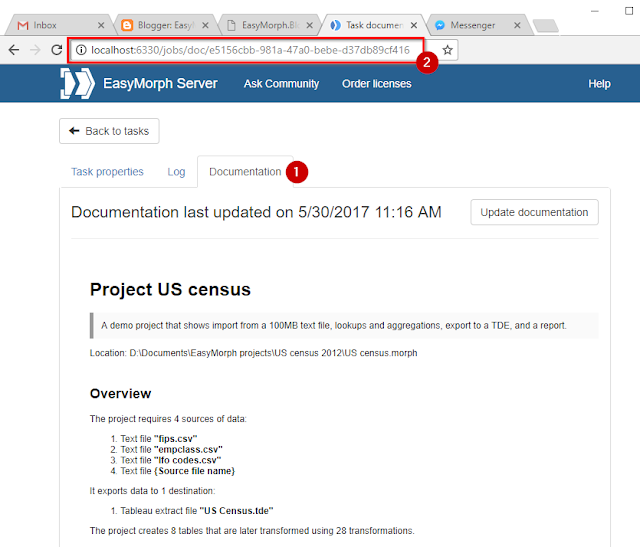 To obtain the auto-documentation link go to the task properties on EasyMorph Server web-console, and switch to Documentation. Then copy the page URL from the browser address bar. Auto-generated ETL documentation (click to zoom). A URL action for documentation is created in the same way as described in the Step 2 above. Once the URL action is created, you can open the documentation right from the Tableau dashboard. 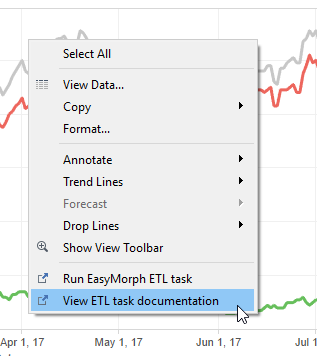 Open task documentation from Tableau. Go to EasyMorph Server web-site.